Last December, Andy Murray replaced Mike Kitchen as coach of the Blues after St. Louis started the 2006-07 season 7-17-4. His day begins at 4:30 a.m. No deviations for an extra couple of winks. No, it’s not the beginning of a work day for farmer Bill or the morning radio drive time host. That’s when St. Louis Blues coach Andy Murray springs from his bed and begins his own preparation ... in preparation for another day at the office, or in his case, the rink. There’s time for fitness and the morning newspaper so that he’s up on current events and, well, just about everything else before he arrives at his office at 6 a.m. This workaholic, eats, sleeps and drinks hockey. He likes to say he’s the gatekeeper -- first in and last out each day. His assistants are there by 6:30 a.m. and they must be just as prepared as their boss. Murray’s father owned a handful of car dealerships in Western Canada, but Andy is not your typical used-car salesman. No, Murray Motors in Surrey, B.C., gets along fine without him. Still, he sells an attention to details in a bottom-line business that is sometimes more cutthroat than any fast-and-furious moment in the automobile business. 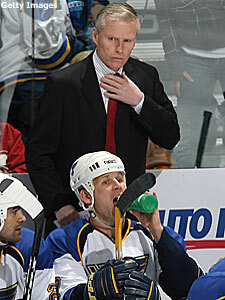 Last December, Andy Murray replaced Mike Kitchen as coach of the Blues after St. Louis started the 2006-07 season 7-17-4. They finished 27-18-9 under Murray, who had been fired by the Los Angeles Kings in five-plus seasons. Murray’s Kings teams never won more than 40 games. Usually a shade better than .500, the Kings’ record was often noted with an asterisk because the club rarely had as many as four of its top six forwards in the lineup healthy for any extended period of time. Blues President John Davidson noticed that, plus the fact that Murray’s teams were rarely outworked. On Tuesday, Murray’s Blues lost, 5-4, in a shootout to Edmonton. The game was important for several reasons -- it gave St. Louis a 16-10-2 record for the season, good for a fourth-place tie in the Western Conference behind division-rival Detroit, plus a 43-28-11 record in the 82 games (or one full season) since Murray became coach of the Blue Note. To put that into perspective, only four times in the previous 39 Blues’ seasons has the team had more than 43 wins. Most revealing, however, is that St. Louis was coming off a 21-win 2005-06 season -- worst in the NHL. And after the 2006-07 season, Murray directed Canada to the gold medal at the World Championships in Russia -- ironically the third time in the last five seasons that Murray has coached Canada and led them to a gold medal -- putting him into a position where it would seem difficult not to choose him to coach Canada when the 2010 Olympics are played in Vancouver. After leading Canada to a 9-0 record in the most recent World Championship tournament and a 17-0-1 record in his three Worlds, Murray dismissed such talk. "The only job I'm worried about now is trying to get the St. Louis Blues in the playoffs so that Team Canada has another coach at the 2008 World Championships,” he said. “But, you can bet that if Hockey Canada calls about a job in 2010, I'll do anything they ask, whether they want me to drive the bus or carry the sticks. I'm a proud Canadian and I'll always be there if they ask me." The chalkboards of notes, reminders, and motivational shorts that adorn the Blues locker room are not a carryover from the previous game. It’s all new every day depending on the team’s opponent ... and St. Louis’ results in its previous games. Those early-rising slogans, quizzes and reminders left under the door of each player on the road, are attentions to detail in Andy Murray’s world. Players who don’t take to these details probably aren’t mentally tough enough to play the regimented, yet room-to-be-creative game that Murray calls up-tempo, yet disciplined. The previous 600-plus words of this column may make you think that Murray’s world is overkill, sort of maniacal. But Andy’s system is embraced by his players. "Right from Day 1, everyone was given a role," said center Jay McClement. "It was laid out on the table and it made it a lot easier for us." "Every player wants more minutes," said defenseman Barret Jackman. "We all want to play the power play, kill penalties and play a regular shift. But Andy looks out for the best interests of each player. He gives you a role that puts you in a win-win situation that is best for the team." "You can tell how prepared he and his coaching staff are by the amount of work that is done each day before we arrive at the rink around 9 a.m.," said Brad Boyes. "What is most important to us is that when we arrive there is what he calls ‘meet-and-greet time’ where either Andy or one of his assistants will come around and talk to each of us about life in general or something personal. It’s a hands-on approach that made me feel welcome the first day I got here last year after I was traded here from Boston in February." "I remember telling the players that they were their own small businesses when I came here last December, that their businesses were failing and we had to get them back on track," Murray said after his first anniversary in St. Louis. "Losing is misery. There’s no way around it. You can either feel good about yourself and win and work extremely hard or not put in the effort and have that losing feeling. And it doesn’t matter how many you’ve won, whenever you lose, it’s misery." While we all have noted during the course of this season how the Central Division has risen to arguably the best in the NHL, there’s a clear correlation to the top-to-bottom success -- the fact that Columbus, Chicago and St. Louis all got better last season after changing coaches during a three-week period from November to December. Murray’s 43-28-11 82-game record in St. Louis is followed closely by Ken Hitchcock’s 37-36-9 record in Columbus and Denis Savard’s 36-38-8 record in Chicago. Murray and Hitchcock are career coaches, Savard a Hall of Fame center who waited his turn for nine years as an assistant in Chicago before getting his chance to run the bench. "It’s all about an attention to details -- a work ethic and working within the parameters of the system," Hitchcock said. Savard looks at things from a player’s perspective, with a coaching twist, explaining recently that; "It’s easy to be negative, but that’s not what the players want to hear. I know as a player, I played harder to get out of a funk. That part is no different to convey in an upbeat way as a coach." Work ethic. Belief systems. Positive reinforcement. Staying in touch with your players. They may sound like coaching cliches. But they’re tenets of the job of a good salesman and his staff. And selling the game of hockey to high-salaried players is the ultimate sales job to guys like Murray, Hitchcock and Savard. plenty of energy, plus something for Samsonov and Perreault to watch. ... The goal by Duncan Keith gave Chicago defensemen 21 this season, equaling the total from all of its defensemen in 2006-7. ... The victory against the Kings was the Hawks’ 15th win of the season, giving them 15 wins after 30 games for the first time since 1995. ... After the annual prospects camp in Traverse, Michigan, which includes eight NHL teams each September, I remember asking four scouts from Detroit and St. Louis which young players caught their eyes. Every one of them mentioned a gritty, tough-to-play against Columbus winger named Jared Boll, a fourth-round pick, No. 101 overall, in the 2005 Entry Draft who played junior hockey with Plymouth of the Ontario Hockey League last season. It wasn’t the 28 goals and 27 assists that caught the scouts’ attention, however. In the Blue Jackets training camp, Boll showed why management couldn’t cut him. On Dec. 12, Boll scored his third goal of the season and first NHL game-winner in a 4-1 triumph against Colorado. That goal also showed skeptics that he could do more with his hands but fights -- even if he probably stayed in the NHL because of his league-Leading 11 fights. ... Feel-good story. Even though Manny Malhotra and Jiri Novotny have made their way back to the Columbus lineup from injuries, Kris Beech stays and thrives. He’s been given an opportunity now to center the Blue Jackets’ top line with Rick Nash and Nikolai Zherdev. In his first game with that twosome, he scored his third goal and seventh point in the seven games since being recalled from Syracuse of the American Hockey League. ... Opponents have often accused Nashville winger Jordin Tootoo of playing to hit and hurt people. Some even say they think he doesn’t know there’s a puck on the ice. Well, Tootoo had a fight against Anaheim defenseman Joe DiPenta Dec. 9. Nothing unusual there. But then he added a goal and an assist to lead the Predators to a 4-2 victory against the Ducks. The outburst gave Tootoo 10 points (six goals, four assists) in 27 games to match his previous season high in points. So, maybe he is beginning to find the puck a little more than opponents think. ... Jason Arnott continues to be perplexed by his bad luck around the net. In the last 14 games, Arnott has had six or more shots three times (including a club record 12 shots against Toronto on Dec. 4) but only twice during that span did he score a goal. That included no goals in his last eight games entering the weekend. He’s due for a break. The week ahead -- The Blackhawks have a score to settle with the Predators when they host Nashville on Dec. 19. The Preds won the first two meetings between the teams -- 5-2 Nov. 4 at Chicago and 5-4 in overtime Nov. 15 -- in Nashville. Martin Erat finished off a three-goals-on-six shots first period against Hawks goalie Nikolai Khabibulin in the first game and then netted the overtime winner in the second matchup. ... The Blues feel they need some evening-up with the Red Wings as well after being blanked 3-0 in Detroit Nov. 21. The Dec. 20 contest will be the first of two meetings between the two teams in St. Louis in a seven-day span. The Wings limited the Blues to just 12 shots in a Chris Osgood’s shutout and Dan Cleary had one goal and one assist after getting another goal in the first meeting between the teams Nov. 13 at St. Louis in a game highlighted by two goals by Blues’ rookie David Perron in a 4-3 triumph against Detroit.